“Today’s hearing was to bring forth a discussion on the potential to revitalize communities in northern Minnesota by recognizing the rights of Minnesotans to exercise their mineral claims if any proposed mining projects can satisfy all of our stringent environmental requirements,” said Congressman Emmer. “We have a real opportunity to reverse the politically motivated and short-sighted actions the Obama Administration enacted on their way out the door and bring good-paying jobs and revenue to a region that greatly needs it. Like all Minnesotans, I believe in preserving and protecting our natural resources and I have no doubt that we can find a way to preserve Minnesota’s pristine landscape without permanently destroying any future job creation or economic development in Minnesota. I am pleased we have taken action today to get us one step closer to allowing the research and exploration process to proceed, while protecting the potential future economic opportunities in the great state of Minnesota,” he concluded. 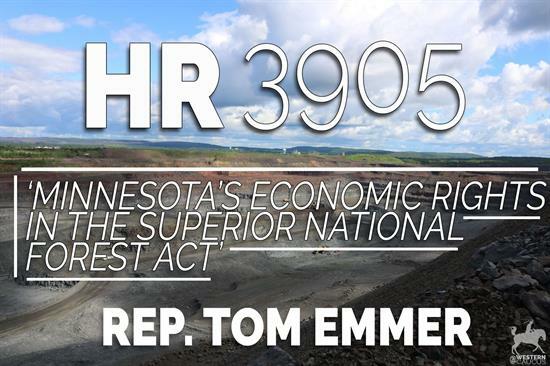 Today, the House Committee on Natural Resources Subcommittee on Energy and Mineral Resources examined Rep. Tom Emmer’s (MN-06) draft legislation which will allow responsible mineral production to continue in Northern Minnesota. Nancy Knorr, Chairman of Jobs for Minnesotans, testified in strong support of the bill. To watch the video of the hearing, read other witness testimony and view other important information click HERE. Rep. Gosar showed a video at the hearing produced by the people of Minnesota on this issue that can be viewed HERE. In the video, Dave Lislegard showed us Lake St. James, a reclaimed mine site that now provides the drinking water for the city of Aurora. He stated that this is some of the best water in the country. No one wants to contaminate Minnesota’s water or the boundary waters. In the waning days of the Obama Administration, federal land management agencies took several actions that could decimate local economies, stifle job creation and cause significant harm to K-12 education in Minnesota. Rep. Tom Emmer’s bill rejects this overreach, calls for the rescission of the proposed 420,000 plus-acre federal mineral withdrawal application and the renewal of two improperly terminated leases. In June, Reps. Gosar, Emmer, Westerman and Nolan toured several mining operations, held a stakeholder meeting and visited the proposed federal withdrawal area outside of the city of Ely, Minnesota. The comments they heard on the ground from American families, businesses and individuals who want these jobs and support these mining projects led to this effort. On June 30, 2017, 26 bipartisan members sent a letter to Secretary of the Interior Ryan Zinke and Secretary of Agriculture Sonny Perdue calling for the rescission of the 420,000 plus acre mineral withdrawal and the renewal of two improperly terminated leases. To read the letter click HERE. To read the press release click HERE. On January 5, 2017, the U.S. Forest Service (USFS) proposed a 234,328-acre federal mineral withdrawal of National Forest System (NFS) lands, for a 20-year term, within the Rainy River Watershed on the Superior National Forest, immediately placing this vast area off limits to development for up to two years while the 20-year withdrawal is considered. The total withdrawal application boundary spans approximately 425,000 acres, including 95,000 acres of state school trust fund lands. In conjunction with this massive mineral withdrawal, the Obama Administration’s Bureau of Land Management (BLM) inappropriately rejected Twin Metals Minnesota’s application to renew two hard rock mineral leases in Minnesota’s Superior National Forest – leases that were signed in 1966 and renewed without controversy in 1989 and 2004. To date, Twin Metals has invested upward of $400 million – a significant investment – in reliance on two federal mineral leases that the BLM executed with the company's predecessors and renewed each time they expired. All told, Minnesota is projected to lose up to $3 billion in royalty revenues for the State’s Permanent School Trust Fund that would support nearly 900,000 K-12 students statewide if the withdrawal application and cancelled leases are not rejected by the new administration. If left unchecked, the anti-mining actions pursued by the Obama Administration will block the creation of thousands of American jobs and cost the U.S. economy billions of dollars. The University of Minnesota-Duluth estimates the creation of 12,000 construction jobs and 5,000 long-term mining jobs if mining projects already being pursued in Duluth Complex are allowed to move forward. These are good-paying jobs, as the average annual mining wage in Minnesota was $78,635 in 2015. These projects are also estimated to generate $2.5 billion annually for the economy. The proposed withdrawal also contradicts the legislative intent of Congress. In 1950, Congress took action to make minerals available for mineral exploration and development within the Superior National Forest. In 1978, Congress passed the Boundary Waters Canoe Area Wilderness Act (BWCAW), a historic compromise that prohibited mining within the Boundary Waters Area but explicitly permitted mining to occur in the Superior National Forest. Environmental stewardship and positive economic growth are not mutually exclusive. Our members support regulations that ensure environmentally-responsible mining in order to protect water quality and preserve the scenic beauty of the Boundary Waters area, where significant buffer zones already exist, including areas created by the BWCAW Act and the Minnesota Outdoor Recreation Act. Furthermore, any new mines proposed in the region will have to undergo, and adhere to, strict mandates and requirements under the National Environmental Policy Act (NEPA), state laws and other regulations. Unfortunately, the environmental study affiliated with the withdrawal pre-empts this comprehensive review from taking place, blocking the opportunity for a project to even be considered. Minnesotans across the state have supported the development of the state’s mining industry, and specifically have voiced support for the Twin Metals project. Countless individuals and local businesses have weighed in against the actions of the Obama Administration. Government officials on both sides of the aisle have publically opposed these actions. In January, the Minnesota State Legislature sent a letter and “expressed their outrage at the recent politically driven decisions.” Additionally, the Lake County Board of Commissioners unanimously approved a resolution opposing the proposed withdrawal. The Duluth Complex holds the world’s second largest copper deposit, third largest nickel deposit and second largest platinum-group metals deposit.